Android Wear 2.0 is launching on February 9, and now we may have our first look - albeit a blurry one - at the LG-built smartwatches that will carry Google's updated wearable operating system. 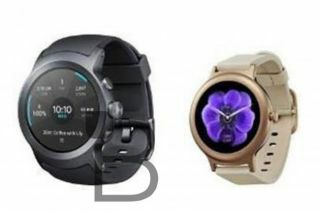 The picture above comes courtesy of TechnoBuffalo, which says a source provided the image purporting to show the LG Watch Sport and LG Watch Style. The LG Watch Sport is on the left, and the LG Watch Style on the right. We've heard these names linked to the new watches before, so it's likely the monikers will stick once the devices become official. Word is Google and LG have partnered on the watches in a relationship similar to Nexus devices (device built by a manufacturer for Google). Though fuzzy, you can see the Sport is intended to be a more active-style smartwatch with, we speculate, an emphasis on fitness. The Style, meanwhile, has a slimmer, more fashion-forward look. Consumers are clamoring for smaller smartwatches, and if this image is true to the real thing, the LG Watch Style could meet that need. Noted leaker Evan Blass revealed specs for the smartwatches in a VentureBeat report last week, and those seem to match up with what's in the image. The LG Watch Sport will reportedly feature a 14.2mm thick watch with a 1.38-inch, plastic-protected 480 x 480 OLED screen. It's said to have 768MB of RAM, 4GB of internal storage, a 430mAh battery and heart-rate sensor. Tantalizingly, it will also reportedly feature 3G and LTE connectivity, so you can make and receive calls without your phone around. Unlike the Style, it will feature GPS and NFC to support Android Pay. The LG Watch Style's specs are less robust - it's said to measure 10.8mm thick with a 360 x 260 1.2-inch OLED screen, also coated in plastic. Smaller measurements aren't necessarily a bad thing, though, as this could give the device a lower profile on your wrist. Elsewhere, the Style will reportedly house 512MB of RAM, 4GB of flash storage and a 240mAh battery. It won't be waterproof like the Sport, but will be resistant against water drops. Blass's report said the devices are circular, and, if you trust your eyes, you can see that's the case in today's leak. Both will supposedly feature limited iOS compatibility, Bluetooth and Wi-Fi functionality. Google is rumored to host an event on February 9 to launch Android Wear 2.0 and, it would seem, these LG-made watches. Whether the watches can take on Apple Watch and lead a new wave of Android Wear devices ... let's just say, that picture is just as blurry.